While you’re at the fair, grab some history. 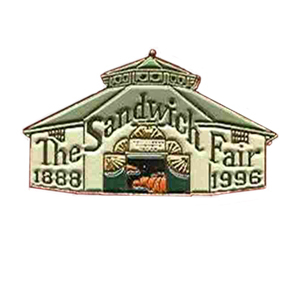 If you’ve come to love the Sandwich Fair, you’ve probably come to love its history. Want to learn more about this year’s fair? Headliners at the main stage: Justin Moore, Chris Cagle and Dustin Lynch, Easton Corbin and Back Country Roads, Brett Eldredge, and Frankie Ballard. The wood section of the grandstand is closed and the 100-year-old grandstand is torn down. New entertainment includes a hot air balloon, the duck races, and the Lumberjack Show, and a new hospitality Pavilion is built, sponsored by Heartland Bank. 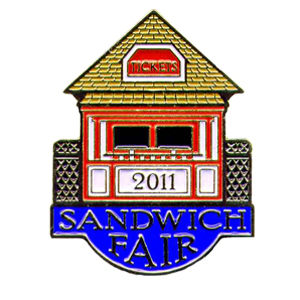 Sandwich Fair is known for the longevity of its vendors. 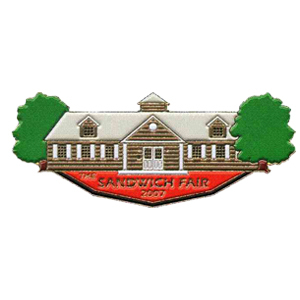 Log Cabin, famous for homemade pie, (operated by United Church of Sandwich) has been at the fair 75 years; St. Paul’s Catholic Church stand for 50 years, Otto’s train for 55 years, Open Door Rehabilitation Center for 45 years, FFA Zoo for 40 years, King & Sons Monuments for 90 years. Admission is $8. Thirty-two acres was added for parking. A new main office was built, and a Fair Museum opened. Twenty new trees planted each year. Entertainments included first old time fiddle contest, bands at Ag Land Stage, and WGN noon shows. Fairgrounds had grown to 170 acres. Fair Board President Carlton “Dutch” Hough received Outstanding County Fair Award and State Fair Person of the Year Award. A decade of improvements: copper water lines installed in the buildings, blacktop by front and west gates. Racing ostriches returned to entertain the crowds. The decade saw record attendances of near 136,000. Fay’s chicken and pork chop BBQ was introduced. Attendance increased when hundreds came on Burlington steam train excursion from Chicago on Saturday and Sunday; round trip fare was $4.65. Rides were 9 cents on Children’s Day; gate admission was 60 cents; a season ticket was $2. Improvements included a new midway with lighting and improved women’s restrooms. Visitors were entertained with a three-ring circus and vaudeville performers. Special exhibits were Victory Gardens and camera club photos. Poultry shows for the entire U.S. were suspended by Dept. of Agriculture. For the first time, commercial exhibitors paid for a space. Hard times resulted in smaller crowds at the fair. For the 50th Anniversary in 1937, buildings were painted white and “put in first-class” shape. Electricity to the grounds made it possible for the fair to continue into the night. Some years there were fireworks every night. Fairgoers competed in horseshoes and ballgames. Entertainment included automobile and motorcycle races, flying machines, and high-wire acts. A manure spreader displayed by Sandwich Mfg. Co. was a popular exhibit. During this decade, attendance grew to over 22,000. Sandwich residents were encouraged to have the city “looking nice” to give a good opinion. Improvements were made that included a large dining hall, a regulation racetrack, horse barns, exhibit buildings, and a grandstand. 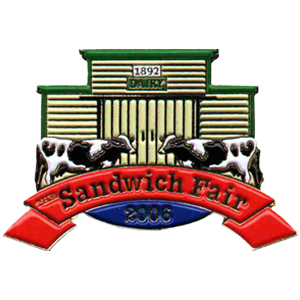 Local livestock group purchased 20 acres of land and the first Sandwich Fair was held in September. 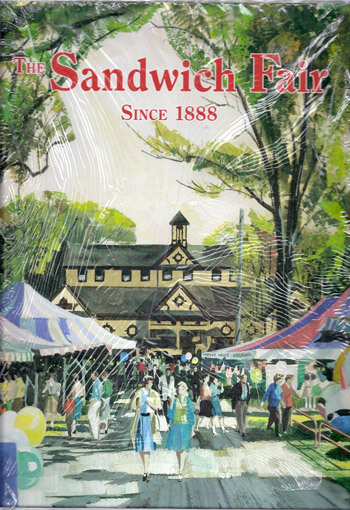 Visit the fair museum while at the fair! 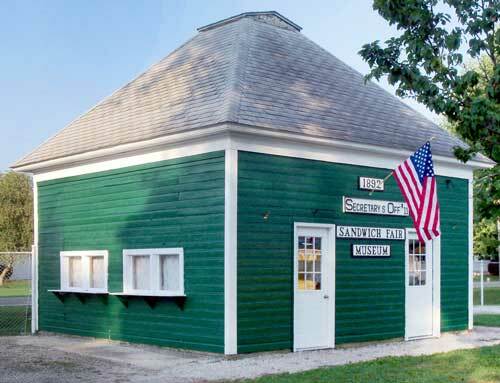 Located west of Otto’s train and south of the windmill in the 1892 dark green Secretary’s Office, it’s one of the oldest buildings on the grounds. 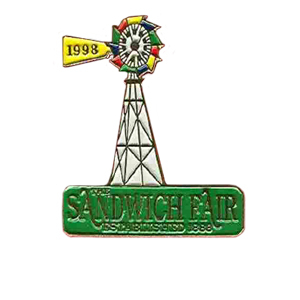 On display is a timeline from the beginning of the Fair until 2000, items that were given away or sold at past fairs, and items from a different area collector each year. The museum is a stop for Activity Book stamping and has DVD’s running on a TV from years past. New items are continually being donated, so there is always something new to view and friendly hosts to greet fairgoers and help answer questions. 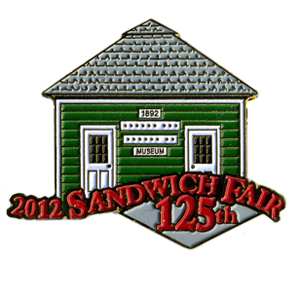 Written and compiled for the 125th anniversary of the Sandwich Fair. 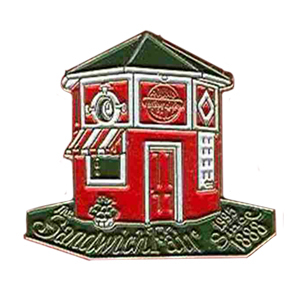 Come take a look at the history of Sandwich from its beginnings in the mid-1850s to today. 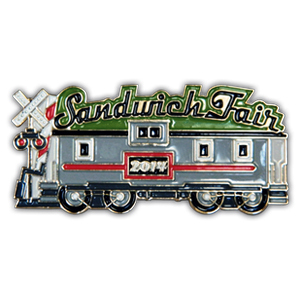 First known as Newark Station, the town’s name was changed to Sandwich in 1856 by Congressman John Wentworth, after his hometown in New Hampshire. Wentworth was instrumental in getting the railroad to stop here. 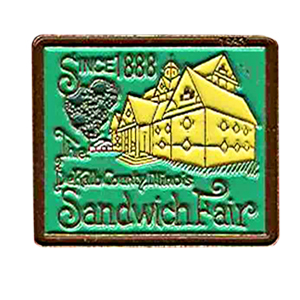 Sandwich, surrounded by the fairest and most fertile country, was advertised in 1892 as one of the most beautiful and prosperous cities in northern Illinois. 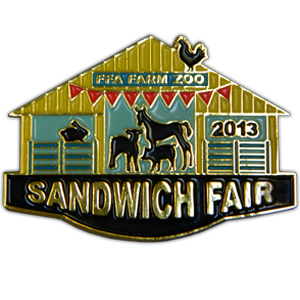 Its agricultural implements, made by the Sandwich Manufacturing Company and Enterprise Company, were shipped worldwide. 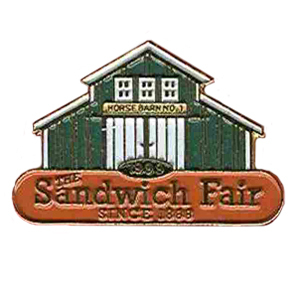 Sandwich is now known for its annual county fair, antique shows, and shopping. About the author: Joan Bark Hardekopf is a longtime resident of the community. Her family roots date back to the earliest farms. 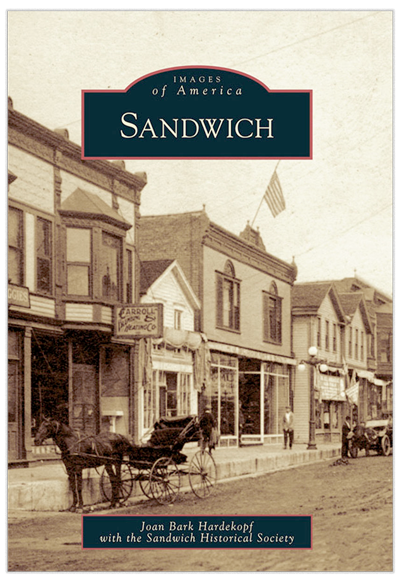 Along with members of the Sandwich Historical Society, Hardekopf is pleased to present this book as part of the 150th celebration of Sandwich. Royalties will help fund the sesquicentennial in 2009. A grandstand ticket office was built in 1945. 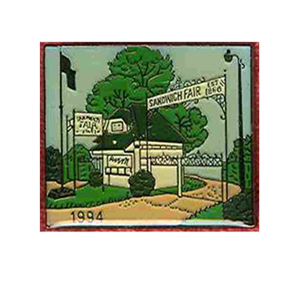 In 1970 it was moved to Gate 4 on Suydam Road when a larger ticket office was built. The original building (now Main Stage Ticket Office) is used today for main stage and, track and infield ticket sales. The present Collections Building (#52) was opened in 1997. Prior to this, displays were exhibited in the Arts and Crafts Building. You will find antiques, nature collections, carnival glass, porcelain dolls, belt buckles, and so many more categories of collections. Art by Jackie Dannewitz. 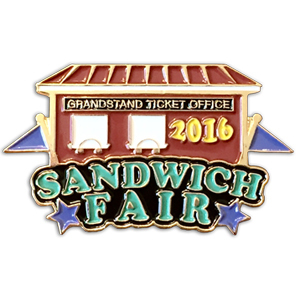 For the second time, the original Ticket Office was featured on the 2011 pin. Built in 1897, it was located at the Main entrance on Suydam Road just around the bend from the present Secretary’s Office. It is now located at Gate 5. Drawing by Jackie Dannewitz. Fans have attended the popular tractor pulls held at the Fair since 1965. The pulls originally took place in front of the grandstand on the racetrack. A new 300 foot track was installed in 1997, just inside the racetrack. 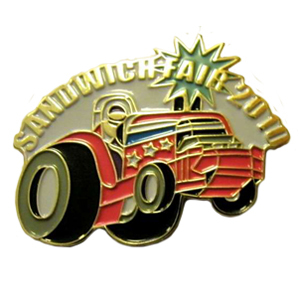 The 2010 pin shows one of these sophisticated pulling tractors. Drawing by Jackie Dannewitz. Gas engines and farm machinery have been on display at the Fair for over a century. 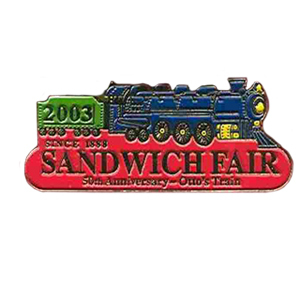 The 2009 pin reminds fairgoers of days gone by. Gas engines and antique farm machinery are displayed inside the train track. Drawing by Jackie Dannewitz. 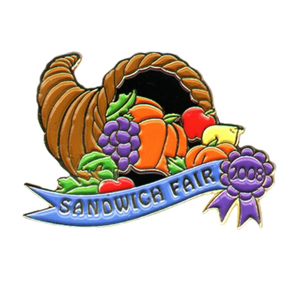 The cornucopia shown on the 2008 pin boasts prize winning produce exhibited at each Fair. Today’s premium book lists over 500 open and junior entry choices in the horticulture department. Drawing by Jackie Dannewitz. 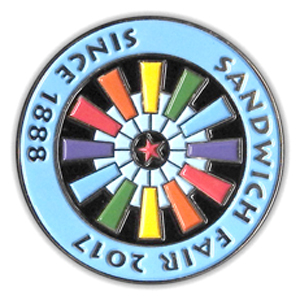 Built in the same year, the Secretary’s Office was featured on the 2007 pin. 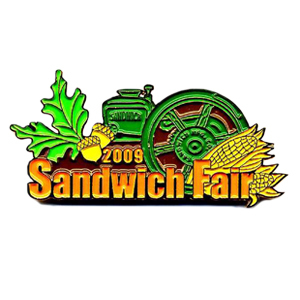 It is located on the southeast corner of the Fairgrounds and used year round by the Fair Secretary, staff, and directors. Drawing by Jackie Dannewitz. The Dairy Barn dates back to 1880. It’s the oldest building in use on the Fairgrounds. In 1925, it was moved 30 feet to the east. An addition was added in 1992, and a lean-to in 1996. Drawing by Jackie Dannewitz. 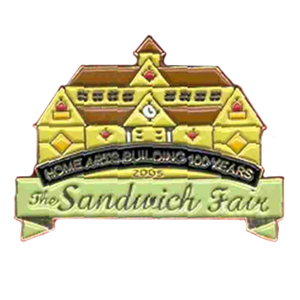 The Home Arts Building appears for the third time on the Fair pin! Fairgoers were treated to birthday cake to celebrate this building’s 100th birthday. Over the years this building has been called Floral Hall, Industrial Hall, Women’s Building, and presently the Home Arts Building. Drawing by Jackie Dannewitz. 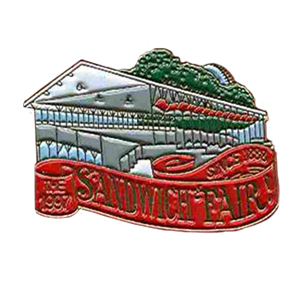 Built in 1904, the Hog Barn was featured on the 2004 pin to celebrate its 100th birthday. Additions were made to this building in 1922 and 1956. A covered show ring was added in 1985. Drawing by Jackie Dannewitz. The iconic Otto’s Train has offered rides to families since 1953. The Iron Pony was replaced in 1974 by a Burlington 3000 replica. Both trains were built by Augie Otto of Sandwich. Drawing by Jackie Dannewitz. 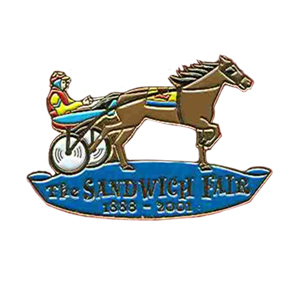 Harness racing has been an attraction during the Fair since it began. The original half mile track, just south of the present racetrack was in place in 1888. Today’s racetrack was installed in 1891. Drawing by Jackie Dannewitz. The Horse Barn is located at the entrance of Gate 4. The race horses housed in this building for most of the year are relocated, so the poultry exhibits can move in during the Fair. The Horse Barn was built in 1914. Drawing by Jackie Dannewitz. The Grandstand was built in 1913 for a cost of $5,250. Additional bleachers were added to the west end in 1927 and the reserved section was added in 1946. Drawing by Quen Carpenter. The octagon shaped Horticulture Building was rebuilt in 1931 and resembles the structure that burned that same year due to leaf burning. An addition was built on the east side in 1957. Drawing by Quen Carpenter. The Round Office was moved to its present location in 1906. It was built in 1900 and believed to have been used as a bandstand and judges stand or timers stand at the racetrack. 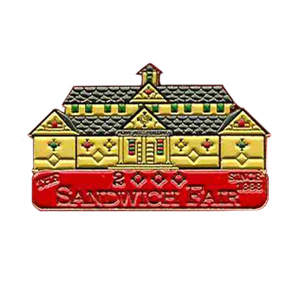 This is the first of many pins that is shaped like the building it depicts. Drawing by Quen Carpenter. 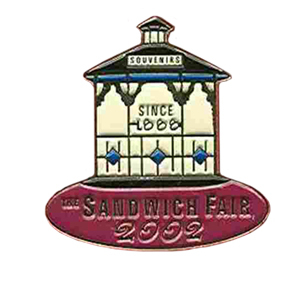 This enameled pin shows the original Ticket Office (built in the late 1800”s) and gates which are now located at Gate 5 on the west end of the Fairgrounds. Drawing by Quen Carpenter. 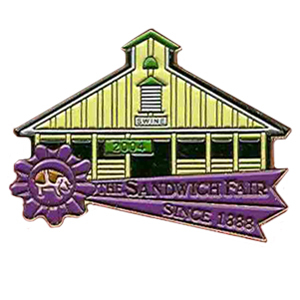 The very first Fair pin featured the Home Arts Building. This building, built in 1905, is home to both open and junior culinary and needlework exhibits. 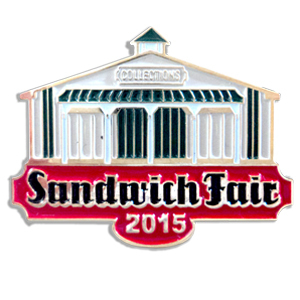 This year also marks the first year the Fair sold “official” Sandwich Fair Souvenirs. Drawing by Quen Carpenter.